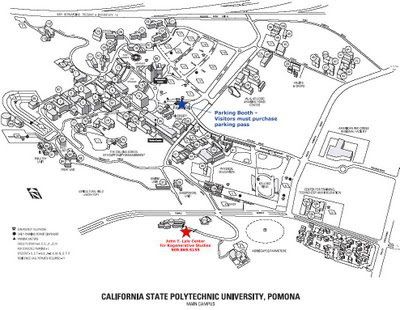 This map is linked to Cal Poly Pomona; clicking on it will get you a map that is actually readable. 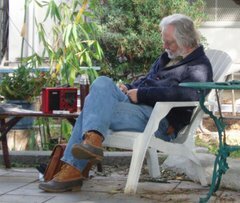 Information about getting to Cal State Pomona's John T. Lyle Center fro Regenerative Studies from their website. From Orange County or the 60 Freeway (East or West): Take the 57 freeway North, exit at Temple Avenue and turn left (down the hill). Turn left on University Drive. Follow University Drive as it winds around past the Farm Store to the top of the hill. Parking for the Center is located on your left at the top of the hill. Then proceed on foot down the roadway into the Center. The main office is located straight ahead. From the 10 Freeway (East or West): Exit at Kellogg Drive. Stay in the left lane, and when you come to the stop sign, the large electronic marquee that welcomes visitors to campus will be on your right. Follow Kellogg Drive as it winds around the campus. At the second stop light, turn right on Campus Drive. At the next stop light, turn right on Temple Avenue and move to the left lane. Take a left at the next light (University Drive). Follow University Drive as it winds around past the Farm Store to the top of the hill. Parking for the Center is located on your left at the top of the hill. Then proceed on foot down the roadway into the Center. The main office is located straight ahead. A valid parking permit must be displayed in all vehicles parked on campus 24 hours a day, seven days a week. Handicapped parking zones are enforced 24 hours a day, seven days a week. Invited guests of the Center can pick up a complimentary parking pass in the Center's main office. All other visitors must purchase the $5 daily parking permit at the Visitor Parking Booth on Kellogg Drive. See map for location of parking booth. We will discuss carpooling at class tonight. Also, please note, that I may not be there exactly at 1:00 as I have a previous engagement that morning. My friend, Orchid Black, will be there at the start and I'll join the tour as fast as I can get there.